Flower Show 1, Railway arch Fairfield Street, Manchester. Does anyone know where I can find another copy of the 1st Warehouse video? I was at the gig and would love to see it again. Same here — this and the others. 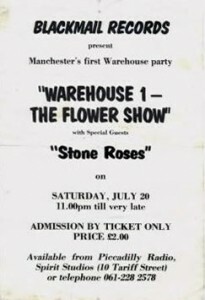 I went to this gig with my sister and her boyfriend Dave Hicks who I was in a band with that the Roses supported once I think?? I also remember chatting to Harry from Inca Babies and I’m not sure I dreamt this or not but for some odd reason seem to think Blixa Bargeld was there.